* Forms 601, 602 and 690: Which should be used? * LETTERS which may be modified and used in conjunction with Immigration vaccination waiver. * Summary of IMMIGRATION laws regarding waivers to vaccination requirements. We have had many requests for assistance in immigrating to the U.S. legally while remaining vaccine-free. There are new policies in place and the process is fairly complicated unless you read carefully what we have posted on our website. If you know someone in this situation, please have them review the material we have outlined here at www.vaclib.org/legal/immigration.htm#immigration and then contact us directly for further assistance. 2. Go to the appointment that Immigration sets up and be found inadmissible. 3. File I-601 Waiver of Grounds of Excludability. And pay a $930 (23Dec2016) fee with the Waiver. Note: we recommend filing on religious grounds rather than moral. Links to the Form I-601, sample letters and other information are below. Form I-601 is now a filable PDF that one may write in or check the appropriate box. As an example on Page 3 for "Part 4. Reasons for Inadmissibility"
C. Your belief or conviction is sincere. Immigrants who wish to be exempt from vaccination requirements must fill out this form and pay the Filing Fee. Please review the instructions for i-601 before downloading the i-601 form. There may be important changes to the instructions for completing and filing the form. You will need Adobe Reader to fill, view or print these forms in Portable Document Format (PDF). Currently the Filing Fee is $930 (23Dec2016). See above link to page of instructions. (A) In general.-Any alien who, in the opinion of the consular officer at the time of application for a visa, or in the opinion of the Attorney General at the time of application for admission or adjustment of status, is likely at any time to become a public charge is inadmissible. Which Form: 601, 602, or 690 should I use? If you are in a country other than USA and applying for Immigration. Q. There is no mention of Vaccination on this document, so how can it be used for the exemption from vaccination? if you are a refugee. 1. What Is the Purpose of This Form? This form is used to apply for a waiver of inadmissibility by an applicant for adjustment of status under section 245A or 210 of the Immigration and Nationality Act (INA). What does 210 and 245A refer to? (iii) is seeking an immigrant visa as an immediate relative under section 201(b), if, prior to the admission of the child, an adoptive parent or prospective adoptive parent of the child, who has sponsored the child for admission as an immediate relative, has executed an affidavit stating that the parent is aware of the provisions of subparagraph (A)(ii) and will ensure that, within 30 days of the child's admission, or at the earliest time that is medically appropriate, the child will receive the vaccinations identified in such subparagraph. When the adoptive or prospective adoptive parent cannot sign the affidavit in good faith because of religious or moral objections to vaccinations, the child will require a waiver under section 212(g)(2)(C) of the Act. The requirements for this waiver are described in the policy manual, HTML online version, Section E, Waiver due to Religious Belief or Moral Conviction [9 USCIS-PM C.3(E)]. Foreign Adoption, I-130/I-601 and dealing with regulations. See our Introduction and Summary above. The following is a edited and revised version of a letter which resulted in receiving a green card without vaccination. Brackets [ ] indicate areas where you will fill in the item as applies to yourself. Or in the case of the statement about 'religious conversion', 'out of state religious advisor', etc - eliminate if it does not apply. This is a personal statement to explain my position regarding immunizations. As a student of natural health I understand the position of the United States Government to protect its citizens from potential dangers from infectious disease. I have submitted to a comprehensive medical exam and have been found to be healthy. Never has my lack of vaccinations been an issue regarding the safety of my fellow employees or the public at large. I have submitted documentation from [country of origin] indicating that I have had naturally most of the childhood illnesses that are required for vaccination. Because I have had these illnesses, I have natural immunity and do not require additional inoculations. I have lived in the United States as a student on and off for  years. This is a wonderful country, and I consider it a privilege to be able to live and work here with my [wife]. One of the things I admire the most about the polices of The United States is the respect of personal liberties. I decline to receive vaccinations based on my religious beliefs. According to my religious convictions I not only decline foreign inoculations into my body, but all medications. [When I was 13 years old my family and I had a religious conversion.] Since that time till today I have relied on God as my Lord and protector. (3) the religious or moral conviction is sincere. I have submitted this form, complied with the requirement, and paid the $--- fee. In addition to this letter, you will find an attached letter from my local minister in whose church I am an active member[, and a letter from my out of state spiritual adviser in my file.] These letters confirm that receiving vaccination is against my religious beliefs. This is a personal statement to explain my position regarding vaccinations. As a registered holistic nutritionist and a student of natural health, I understand the position of the United States Government to protect its citizens from potential dangers. I have submitted to a comprehensive medical exam and have been found to be healthy. I have strong spiritual/religious convictions about the natural care of the temple that is my body and every day of my life is spent in devotion to keeping my spiritual physical being healthy and naturally immune to disease. I have received some vaccines as a child and as a young adult. Since that time my religious and spiritual convictions have become stronger and I am strongly devoted to God and to keeping my body free from anything that is not from God. From my previous inoculations and from the years and years of healthy devotion to the basic natural laws of health I do not need any further vaccinations. I have recently married a wonderful man who is a United States citizen by birth. The United States of America is a wonderful country, and I consider it a privilege to be going through the process to be able to live here with my husband. One of the things I admire most about the policies of The United States is the respect of personal liberties. I decline to receive vaccinations based on my spiritual and religious beliefs. I am a vegan who does not consume animal products and eats mostly raw natural foods. I not only decline inoculations into my body but also refuse the intake of all medications and synthetic additives and preservatives. I rely on God and God’s natural whole foods to protect and keep me strong. I have submitted this I-601 form, meet the requirements and paid the $--- filing fee. I have also attached 3 letters from persons who can attest that receiving vaccinations is against my spiritual and religious beliefs. I am a close friend of ____________ and have known her well for many years. In all the time that I have known _______ it is her strong convictions towards her beliefs that have made her a beautifully spiritual being and a healthy inspiration to others. She has strong devotional beliefs to her spirituality and religion. These beliefs include treating her body by the basic laws of God and Nature and not ingesting anything that is chemically, synthetically produced or produced using animals. For all the time that I have been close to _________, I have always known her to adamantly refuse the idea of vaccines or of taking any medications at all. She relies on her spirituality and her devotion to the laws of Nature/God to guide, protect and heal her. _________ has asked me write this letter to support her form to waive vaccinations and I have no problem doing this as I know that getting vaccinations would go against all that she believes and is religiously devoted to. I am a US-born Citizen that has recently moved back to the US to be close to my family. I have sole custody of my daughter and would be facing extreme hardship if she is denied permanent residence before her I-94 expires on _______ __, ____ as I would be forced to move back to _______ with her, and we would lose all of the emotional, cultural and family support that we have here in the United States. I have attached three support letters, a copy of her birth certificate to establish our family relationship, a copy of her passport with I-94A departure record verifying how long she can stay in the US, a copy of my US passport to verify that I am a US Citizen and a copy of the court order verifying that I am the sole custodial parent. What about refugees who object to the vaccination requirements because of religious or moral reasons? (3) your objection is sincere. If you believe there is any other humanitarian reason why INS should waive the vaccination requirements for you, you need to submit Form I-602 with your adjustment of status application. * TRAVEL for US citizens. * Advice for travel to a "tropical" country. Immigration and traveling as a citizen of the U.S. are two different things. No one will vaccinate you against your will, because by so doing that person assumes full responsibility for the consequences, both legal and medical. "When traveling abroad, you may secure exemptions from vaccines by using Clause 83 of the International Sanitary Code, issued by the WHO and adopted by all its members. It states, in effect, that only when coming from an infected area are vaccinations necessary or the traveler could be quarantined for up to 14 days from the time he left the infected area if the health department deems it necessary. If you come from an area where there has been an epidemic, you will probably be put under surveillance (close watch). This simply means that together with the local health officer you must keep a close watch for any suspicious signs or symptoms. You will probably be required to report periodically to your local health officer for a period of up to 14 days from the time of departure from the infected area. If you notice an outbreak or symptom, you must immediately turn yourself in and submit to quarantine or isolation. "In actual practice, not only is this possibility very remote, but if it should occur, the vaccinated person may be required to submit to the same surveillance as the unvaccinated! Remember, every year, thousands of 'unimmunized' tourists travel in and out of the United States with little or no inconvenience or embarrassment." These new regulations give much more power to the WHO regarding implementation of vaccines or prophylaxis in the event of a worldwide pandemic. See the Yellow Fever section below for more information. Review WHO guidelines. See articles, 23, 30-32 and 43 in WHO's International Health Regulations (second edition) here. ICVPs, CDC 731 (formerly PHS 731), certificate of vaccination, is valid for a period of 10 years, beginning 10 days after the date of vaccination. The ICVP must be signed by a medical provider, who may be a licensed physician or a health care worker designated by the physician, supervising the administration of the vaccine. A signature stamp is not acceptable. 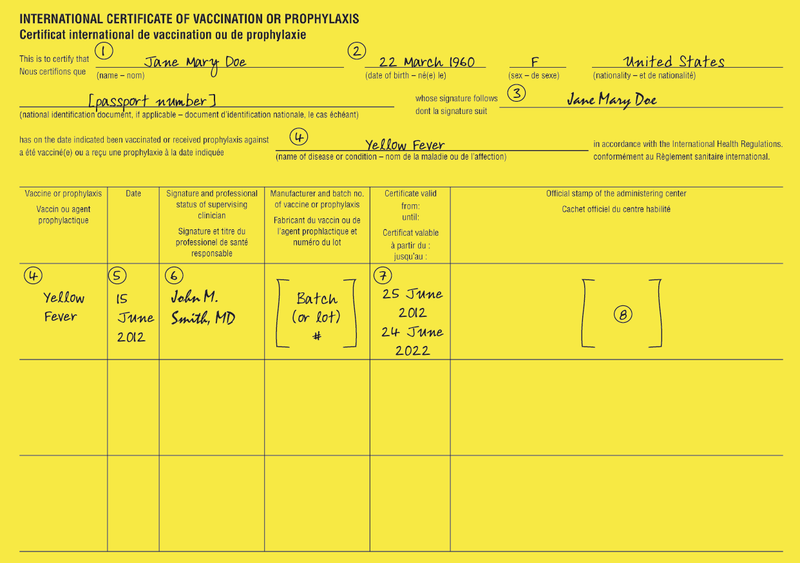 Yellow fever vaccination must be given at a certified center in possession of an official “uniform stamp,” which can be used to validate the ICVP. Location and hours of yellow fever vaccination centers (USA and Territories) may be obtained by visiting CDC’s website here. Some countries do not require an ICVP for infants younger than a certain age (<6 months, <9 months, or <1 year of age, depending on the country). Age requirements for vaccination for individual countries can be found in the Yellow Fever & Malaria Information, by Country section ... . For medical contraindications, a clinician who has decided to issue a waiver should fill out and sign the Medical Contraindications to Vaccination section of the ICVP. * Give the traveler a signed and dated exemption letter on letterhead stationery, clearly stating the contraindications to vaccination and bearing the stamp used by the yellow fever vaccination center to validate the ICVP. * ... how to minimize this risk by avoiding mosquito bites. * Obtain specific and authoritative advice from the embassy or consulate of the destination country or countries. * Request documentation of requirements for waivers from embassies or consulates and retain these, along with the completed Medical Contraindication to Vaccination section of the ICVP. First of all, vaccines recommended for travel, like other vaccines, have never been tested in the field for efficacy, let alone undergone long-term safety tests. We have received stories from travel vaccine recipients who end up with rare blood disorders, autoimmune diseases and/or cancer and either die as a result, or never quite recover their former robust health. Avoid them. Bottled water, in some cases, may be contaminated. A little 35% food grade hydrogen peroxide added to all water will go a long way in making drinking water safe. [Take along a pint of food grade hydrogen peroxide.] Food grade hydrogen peroxide is very strong and should be diluted to a 3% solution before using. Then take the 3% solution and add 3 drops per quart of water or 12 drops per gallon. It is also good to travel with a small portable carbon filter. Cayenne pepper taken with each meal will help the body handle any food slightly contaminated by dirty water. If you do not handle spicy food well, travel with cayenne pepper capsules and take 2-3 capsules with each meal. We also highly recommend traveling with a pound of sodium ascorbate or vitamin C in powder form. Taking up to 10 grams a day in juice or water will give you a strong immune system boost and prevent you from “catching” whatever bug may be going around. Hydrogen peroxide treated water is also good as a final wash on all fruits and vegetables, especially if you are unsure about the sanitation of the water. Regarding mosquitoes, the best internal insect repellent is B-complex and B-2 (riboflavin) in particular. It is also reported that eating lots of raw garlic repels mosquitoes, however, eating a lot of raw garlic tends to repel people, too! Avoid all refined carbohydrates and sugars -- the mosquitoes seem drawn to people who consume refined carbohydrates and white sugar in particular. VacLib’s travel and immigration pages were recently updated since there are a few changes and clarifications that needed to be made. It is important to know that there are no vaccines that are mandatory for travel unless you are traveling from one “yellow fever” country to another “yellow fever” country. For instance, if you are traveling to one country in South America from the U.S. and leaving that same country and returning to the U.S.A. or some non-yellow fever country, you can legally remain vaccine-free. However, we recently dealt with a vegan vegetarian man who was traveling to Peru and then to Brazil. In this situation, it would be very difficult to remain vaccine-free. Following is the advice we gave to “Michael” who most definitely was determined to remain vaccine-free. Page 90 states: Mandatory vaccination, as authorized by International Health Regulations, nowadays concerns only yellow fever. Link to the entire booklet in pdf is http://www.who.int/ith/en/ The following is the description of the document. "International travel and health" is a WHO publication that offers guidance on the full range of health risks likely to be encountered at specific destinations and associated with different types of travel – from business, humanitarian and leisure travel to backpacking and adventure tours. The guidance is intended to help the medical profession to be fully aware of potential risks and to provide appropriate advice, whether this concerns recommended vaccinations, protection against insects and other disease vectors, or safety in different environmental settings. 2) tell the bureaucrat that the homeopathic nosode has been shown to be protective against yellow fever. Make sure you have a signed letter from your homeopath confirming that you have taken this particular nosode. Michael, please keep in touch with us. Your success may be helpful for others in a similar predicament. Unless more of us assert our most fundamental of human rights -- the right to decide what will or will not be injected into our bodies -- then we will have essentially participated in allowing medical martial law to "infect" the masses. Thanks so much for your diligence in protecting your health on your South American venture. Your assertive stance is very much appreciated by all of us! "Pregnant women, babies under one year old and people who are allergic to the vaccine and to eggs do not have to have the vaccination. You will still have to get a certificate from the vaccination centre saying that you have been exempted."